JAPAN: Sony hits the stop button on the cassette Walkman | What Hi-Fi? Sales of iconic personal player to end in Japan when current stocks exhausted; could CD and MD Walkman models follow? Production ended some months back, and sales will end when current stocks are exhausted. But the company will continue to sell the personal tape players, which are now made in China, in some export markets – notably in Asia and the Middle East. The machines have fallen victim to the spread of the Internet, downloaded/ripped music and the popularity of MP3 players and Apple's iPod range. Sony is also thought to be taking a long hard look at the future of its CD and MiniDisc Walkman players, which have also seen a decline in sales, in the Japanese market. The Walkman invented the whole personal music player market when it was launched in 1979. Until then, cassette hardware was all about recorders, and many suggested that consumers wouldn't be interested in a playback-only machine, let alone one only able to be listened to on headphones. Early models had twin headphone outputs, so music could be shared with a friend, and a 'talk' button enabling the sound to be muted for a conversation. It was a development of an earlier Sony personal player, which had been used by the company's then honorary chairman while on long plane trips. The machine he used sold for Y300,000 (then around £650), and was bulky, so the instruction went out to the engineers to make a much smaller, lighter machine able to be sold for less than Y40000 (around £85 at the time). The first machines went on sale on June 21, 1979, after the engineers had also come up with smaller, lighter headphones to match the players. Sony marketed the player by giving machines to young people and celebrities around Japan, and paying people to walk around Ginza, Tokyo's main shopping area, wearing the units. 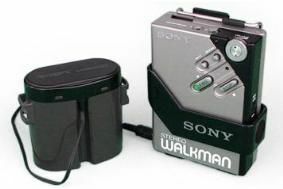 The press launch involved a bus tour, with reporters listening to a recorded commentary and seeing actors posing around Tokyo wearing Walkman players. The Walkman sold out in Japanese stores within a month, and it was launched in export markets soon after: it was called the Soundabout in the USA, the Stowaway in most of Europe, and the Freestyle in Sweden (because the Swedes weren't keen on what they saw as dubious connotations in the Stowaway name!). However, the Walkman name soon became adopted everywhere, eventually making it into the Oxford English Dictionary as a generic term for portable cassette players. In ten years Sony sold 50m units, and the concept was widely copied.